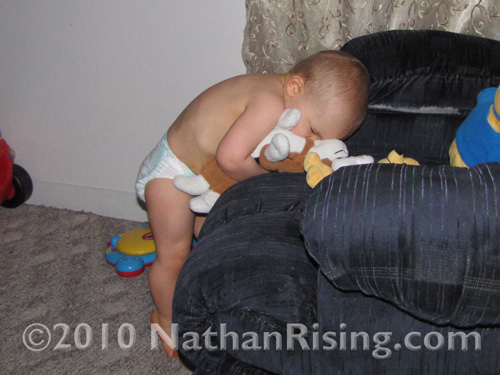 Nathan loves his puppy stuffed animal, a dog we named Ralphie Dog. Whenever Nathan is whining or having a grumpy day, I say, “Nathan, where’s Ralphie Dog?” and he will go find his dog and hug with with such fierceness that if the poor thing was real, it would be suffocated. Or every bone in its body would be crushed. (Good thing he doesn’t love our cats that much!) 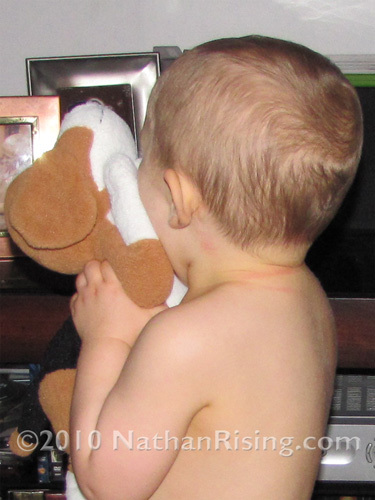 In fact, he loves his doggy so much that he goes around hugging it most of the day. 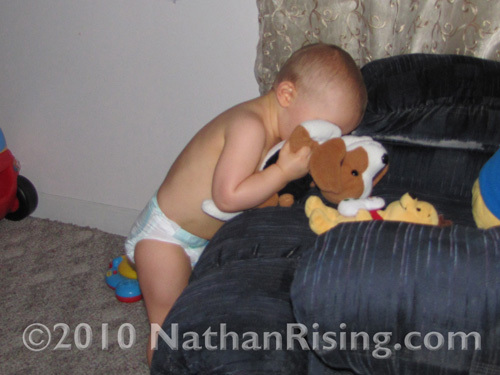 His other favorite stuffed animal is his Pooh Bear, especially when he’s teething. In fact, you can see his trusty Pooh Bear (both of them, even though the larger of the two is partially cut out of the picture) in the first two pictures.